Titan Tube is committed to providing customers with the latest manufacturing technology available to produce parts quickly, precisely, and affordably. Laser cutting tube is a highly productive and flexible method of tube processing which is finding applications in all industries. The recent addition of a BLM Adige LT712D gives us advanced laser tube cutting capabilities on a wider range of shapes including round, oval, rectangle, and square up to 6" in diameter. 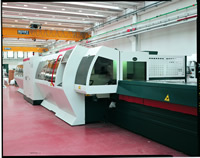 The LT712 is a multi axis, fully automated system that allows for quick set up and high speed, precise operations. By consolidating as many as six manufacturing steps into a single operation, the tube laser system is revolutionizing the tube fabrication process. Removing separate operations such as sawing, punching, drilling notching, machining, and deburring leads to lower costs for our customers.